The fifteenth of August 2001, 15 years ago will always be a day I’ll remember. Picture the scene. I’m at home preparing for another day in my old life as a tennis coach. I’m sorting kit out, working out what to wear, packing my bag, checking registers and eating, another regular morning. I do remember that it was hot, I mean really hot. The kind of hot that means that even after a shower you still feel sweaty and slightly grubby. The kind of hot that leads to restless nights, bothered and hoping for a breeze through the open window. I’d had one of those nights and was irritable. 60+ hours a week on a tennis court with little or no sleep will do that to you. My sister and her best friend, Fiona, worked in Egypt at an expat school in Mahdi. They were respected teachers, loved and looked up to at the school and they knew how to live life to the full. Every holiday they would pick a point on the map, book flights and go. Just go. They’d be out exploring, discovering new things and people. I’d still be working out which pair of shorts would impress the ladies who lunch best. That year, August 2001, they’d been in South Africa. It’s a beautiful place by all accounts, vibrant with stunning scenery. Oh and dangerous – by all accounts – I don’t know, I’ve never been. My parents were at the airport to pick them up after their month long trip before they went back to Egypt. There was another call a few hours later. I pull up at my parent’s house, knock on the door and wait impatiently and irritably. It’s still hot. I find myself staring at two police officers, helmets held under the crooks of their arms. I knew. I mean I just knew. They started to speak; telling me my sister had died in a car crash whilst travelling to the airport. Although I heard the words dimly through the noise of the blood rushing through my head. I didn’t need to hear them. My little sister wasn’t coming home. I’d never see her again, hear her voice or listen to her laugh till she cried. I’d never have her there to stand up for me, even when I was wrong. I’d never be an uncle or interview another boyfriend. I’d never get to witness the impact she’d have on the world. Fifteen years ago since a tow truck driver lit a fire by the side of the road to create smoke and deliberately cause a pile up so he could create work and feed his family. Fifteen years since the driver of the articulated lorry behind the hire car carrying the girls didn’t stop. Witnesses say he was on the phone. Both he and the tow truck driver walked away without being punished. Fifteen years have gone by since that day and I’ve had to stop several times whilst writing this article to compose myself. It’s important that I pass on her message. If I don’t then everything she lived for and the lessons I learned from my sister will fade. That message is one I want you to understand. You see, my sister. Seema and her best friend Fiona lived with purpose. Not a purpose that was a vision based on a distant future but one that they could involve themselves in today. They affected everyone around them with their laughter and their attitude. They never waited for tomorrow or next week. They did everything today. It was the only way they could cram all the things they wanted to do into the time they had. But work wasn’t about saving for the future or building a pot for a retirement fund when they would be too old to enjoy it. They spent it now, enjoying now. Me? I was busy building, making as much money as possible so I could hoard it for the future for when I was old(er) and grey(er). And I forgot something. More than Seema and Fiona, I had a choice. I worked for me, they were employees. I could choose what do to, when to do it and what for. My sister made better choices than I did even though she was an employee. They gave so much of themselves to other people. They built a school in Nepal and stood up for those less fortunate. They gave clothes away and an education to hundreds of children. That giving gave them more reward and value than saving for a retirement that never came. My sister taught me that you can have everything today. You can choose to enjoy everything you have right in front of you today. Or, you can choose to spend that life building a business for the future that you may never get. I’m not saying don’t work. I’m saying be sure you’re working for the right reasons. Yes you want to build a legacy for your children, so do I, but don’t do it at the expense of them not knowing you now. Yes, you want to provide your spouse with nice things. But don’t neglect them and then wonder why they’re sleeping with their personal trainer. Yes, you want to be able to do fun things like go to the grand prix and enjoy fine dining. But who are you going to go with if your friends never hear from you? The things you’re putting off right now, that you say you’ll do tomorrow? Go do them…NOW! Otherwise, they’ll never get done because tomorrow never comes. I hope that I’ve many years ahead of me. Just in case I don’t. I’m going to make sure that when I look up at the inside of my coffin lid I can smile and have no regrets. That there will be no “I wish I had”. Got a business you hate? Change it. Got a spouse you can’t stand? Leave. Got friends who irritate you? Walk away. Spending time chasing a couple of hundred quid owed to you for six months? Move on. Got a yen to go wing walking? Book it. Got an ache, pain that you know isn’t right? Go check it out. Many people suggest to me that I come across as a little lazy. I’m not. I work hard but at times that suit me so I have time to do the things I enjoy. I even have a word for it. Pre-tirement. It’s not easy and you have to work hard maintaining that balance but it’s worth it. And when I forget? I think of my little sister and Fiona, snuffed out at 27 years old who lived life to the full and for whom – tomorrow didn’t come. Thanks for sharing such a personal story – obviously not easy! It’s something we work at and I love the idea of “Pre-tirement”. A great way to think about it. Thanks for that Ash, excellent heartfelt advice for everyone constantly living for tomorrow. Not the only one who needed a moment to compose ………. such a moving story. Thank you for sharing and for reminding me that the only moment i have is ‘now’ and the only answer to life is ‘yes’ not ‘later’. Thanks for the kind words everyone. She certainly had an impact on the people around when alive so it’s good to know she still is. "Ash has time and time again given me a perspective I didn’t know existed"
The first thing that strikes you about Ash is a feeling of calm, kindness and that here’s a thinker. 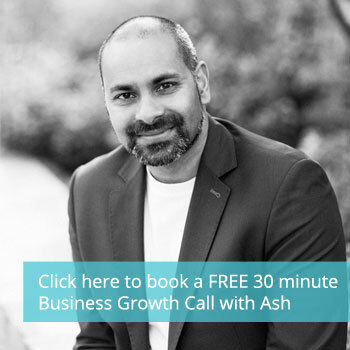 If like me you struggle with growing your business and you feel all over the place but, you know you things could be better there is no better person to talk to. Sometimes in business things go wrong and when you’re stuck in it it’s hard to see a way through. "Ash has a knack for helping you sort out the jumble of thoughts in your head"
Ash has a knack for helping you sort out the jumble of thoughts in your head into definite goals and a plan to get there. Not sure how he does it; my goals are not only bigger than I originally thought but feel more achievable too and the rabbit in headlights feeling has gone. If you need help figuring out how to get where you want or even where you're going, and need someone to keep you accountable whilst cheering you on, Ash is the man you need.